Posted on June 26, 2008 June 27, 2008 by Debito Arudou Ph.D.
Hi Blog. Only yesterday we heard from the Hokkaido Police that NJ were not being specially targeted as terrorists (despite all the evidence presented) for spot ID checks in public places due to the G8 Summit. Well, I just received even more information today from old friend Tyler at Kamesei Ryokan in Nagano that contradicts this claim. The ministries have just told all hotels nationwide once again in a directive dated June 4 that they should be checking passports from “foreign guests” (despite mentioning in the small print that this should only apply to “foreign tourists”). Only this time the new gloss is this is part of “anti-terrorism moves during the G8 Summit”. Yes, all “foreign guests”. Yes, because any “foreign guest” (as opposed to any Japanese, who still do not have to show any ID at check in) might be a terrorist. And yes, in hotels nationwide, as far away from the Summit as Nagano, in this case. Hotels have been resisting this because of the meiwaku caused guests. But the directives below make it clear that photocopies of passports must be taken and kept for future reference. So now groups of foreign guests are required to submit their own photocopies of their passports. Yeah, that’ll fix things. Still want to make the argument that NJ are not being specially targeted as terrorists? I’m sure the Hokkaido Police would. But that would be pretty poor detective work based upon the evidence. This is interesting, as just a month ago I had my passport number demanded of me despite insistnig repeatedly that I lived in Japan and thus didn’t have to provide it. While I’m sure many people will look only at the gaikokujin shukuhakusha at the top, the main text, which the recipients presumably have the responsiblity to read, clearly indicates that only nihon kokunai ni juusho o yuushinai gaikokujin shukuhakusha (foreign guests who do not have addresses in Japan). It would take willful ignorance, and serious disrespect for their customers, on the part of the hotel managers to extend the ID copying to people to whom it does not apply. This should be easy enough to point to if you get refused despite having a Japanese address. I suppose that the hotel could claim to have stricter rules than the Ministry demands, but are they allowed to do that and still keep their lodging license? At one place where I stayed in Sendai, there was a blank headed “Address in Japan, or passport number if foreign”, which, while worded badly, at least let you fill up all that space with a Japanese address and implies that you only have to write the latter if you don’t have the former. Using something like “Domestic address (if not applicable, passport number)” would make things a little clearer. Here also it is clearly spelled out that the only people who have to give passport numbers are those who do not have addresses in Japan. The text about making copies of the passport also indirectly implies that it couldn’t apply to residents of Japan, since they don’t carry passports with them when traveling domestically. If the law said anything about copying alien cards, which are only carried by residents, then we’d have a more serious problem. I have worked a bit in the former Soviet republics of Uzbekistan, Kazakhstan and Tajikistan. When you arrive in any of these countries you have to register your name and passport with the local police, who have a lot of authority. When you check into a hotel, you have to provide a tonne of personal information and details. From what I understand, the hotel then passes all of this information on to the local police who make periodic checks on the hotel. If there are any discrepancies in the information, this is considered an offense. I find it rather sad that an OECD country like Japan, which is a liberal democracy, should employ similar practices to a group of countries that are so poor and run by former Communist Party bosses. I have also been involved in academic survey research in Japan and when you contact some people, they become absolutely furious and aggressive about how you acquired their address or telephone number (which is done by random sampling of publicly available information). Don’t tell me that Japanese citizens do not value their privacy or are happy to let the government or other organizations collect data on them. I cannot say how often I hear the term “privacy” used by Japanese universities and other organizations as an excuse for not revealing some minor piece of data. Handing over your passport information to a private actor like a hotel would certainly seem to qualify as an unnecessary invasion of privacy. > Yes, all “foreign guests”. Debito, it seems you are mistranslating the directive you attached. Or am I missing something in the directive you attached that says ALL foreigner? –Yes you are. Read the whole thing. Surely you can. There are also sentences/sections that say ONLY “foreign guests”, not “foreign guests without addresses in Japan”. This invites (and incurs, in practice) misunderstandings in enforcement this way, as I have pointed out time and time again in previous essays. 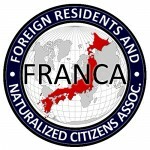 b) Once, when it states that groups operating tours can submit copies of passports of “foreigners visiting Japan” (i.e. it is implied that they have no fixed abode in Japan). 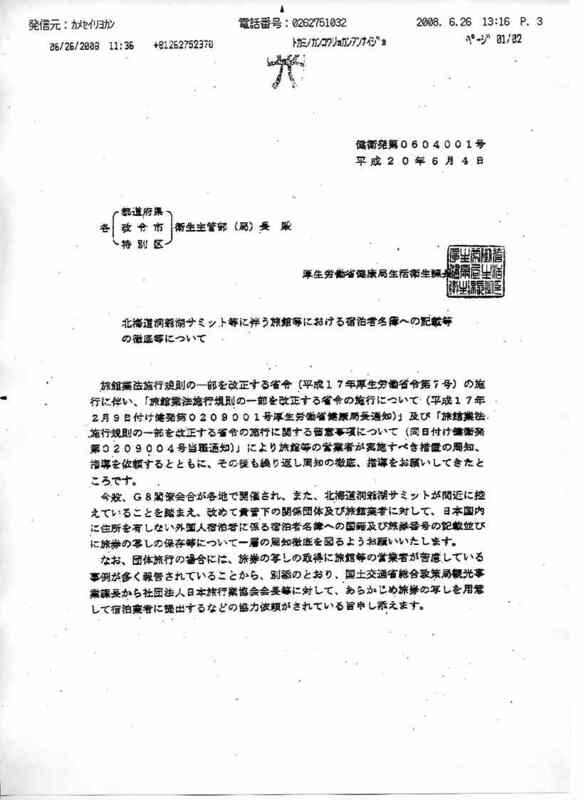 a) One of the titles refers to the document cited above where the “no address” stipulation is clearly mentioned (This is the closest to the Japanese in the title of your post, so I assume this is the part you have the most problems with – although you apparently have not read the document to which this refers). I assume that the hoteliers who read this aren’t stupid, but even if they are, it is laid out in far clearer terms than you indicate is the case. It’s a memo (not a directive) aimed at tourist associations asking them to cooperate with the law as it stands and pointing out that there is a solution to the problems they have been experiencing earlier when collecting passports from tour groups consisting of visitors to Japan. That’s all it is. Further, JTB in association with the ministry is trying to get hotels and tour groups to issue foreign-language explanations of the law in a variety of languages to companies dealing with foreign travelers so they know what is going on. Doesn’t seem like a big government conspiracy to me. –As I said, read my previous articles on the subject. Here’s one I published in the Japan Times back in 2005 in which documents issued by the government make this omission, and hotels in practice enforce it on everyone who looks foreign. This is a systematic misperception sponsored by the government (then, as now) of “the law as it stands”. And hotels really are that stupid and unable to make that distinction. Remember last December on this blog? Toyoko Inn Hirosaki? referring to those same documents with the same discrepancies, despite years of the MHLW being asked to correct them. To no avail. As for the points you make above, you’re assuming the hoteliers/tour groups are going to go through all the librarian steps you did and take the trouble to track down the other documents (my hotel operator only received these two) to make sure they understand the directive (memo, whatever–it’s a command from the GOJ nevertheless). Not likely. As read, whatever mitigators you might want to find within the GOJ communication notwithstanding, the thrust is still, undeniably, “foreign guests have to be kept track of” (as before), “because of faraway Summit” (new motivation). That’s targeting, as I argued. If you’re going to be this assiduous with counterargument, how about being as assiduous with my arguments as I have made and archived over the years? It gets tedious to have people comment without reading the references I provide. Kindly do so in future, Big B. Thanks. Wrote this a two weeks back but it seems more relevant on this page. Just came back from a one-night stay in a hotel in Kaminoyama, Yamagata prefecture. Yamagata is a pretty quiet place and has done no harm to anyone. The hotel room was booked by a Japanese co-worker but he put it under my mates name (a non-Japanese) and there were four of us – 2 NJ 2 Japanese. The staff were very helpful but we (the two NJ) got to the hotel first and were asked if the other two people were also foriengers. On hearing that they were Japanese they told us that we could go to the rooms without having to show passports (which we didn’t have with us being permanent residents). The guy explained to us in very polite Japanese and appearing embarrassed about having to ask about the other two people but said it was because of the G8 and the home office had issued strong requests to check all gaijin. It seems a bit odd that we didn’t have to show identification just because we were staying with 2 other Japanese – a loophole for would be activists maybe. 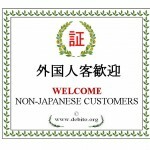 Sorry Debito, but you were talking about the documents in this post when you mentioned that they excluded all foreigners, which they clearly do not do. In every instance except the title of the memo, when the word “foreigner” is mentioned the stipulation is either clearly stated, is part of a title that refers to another document where the same is stated or is qualified by a term like 訪日 which imples no fixed abode. There is no “ommission”. And there is nothing wrong per se in having a hotel ask for passports of people who do not live in the country. Perhaps it would be a bit clearer if you could tell us exactly which phrase you think refers to “all foreign guests”. What SPECIFICALLY could the government improve in these memos? I did read the references you provided, and while interesting, they didn’t really apply to these particular documents except that the current ones might be said to be an improvement on the past. As to the signs you just posted, please compare them to the current ones. You’ll see they are quite different, both in the Japanese and English versions. The ones currently offered by the MHLW are an improvement. The people at Toyoko Inn are assholes who go out of their way to stick it to minorities, if your experience and the barrier free incident are anything to go by. But they are not the Japanese government. –Specifically: The stand-alone phrase “gaikokujin shukuhaku sha” appears from the document dated April 8 three times, without qualifier for address. Improve that. You must attach that qualifier for address every time to counteract the past discrepancy and repair the damage done for years now. 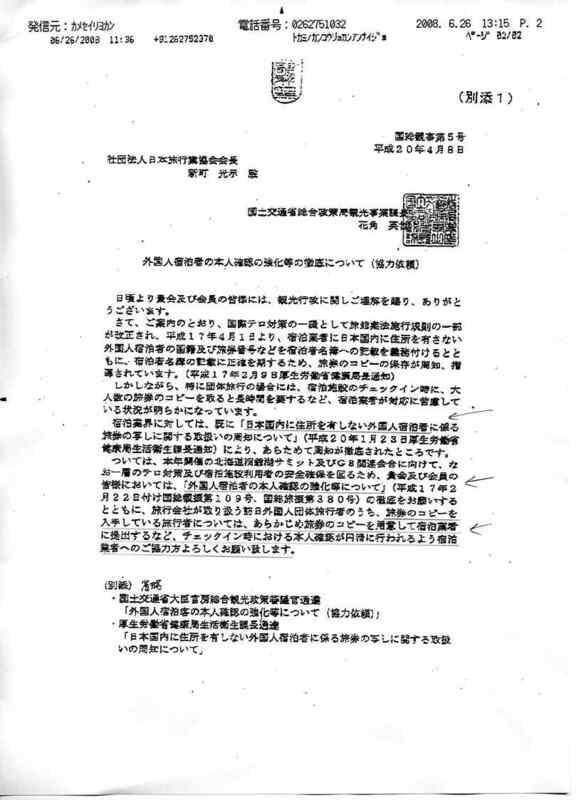 In the document dated June 4, the title talks about passports from “shukuhaku sha” (since no ID is required from Japanese at all, let alone passports, this must mean foreigners), and the first paragraph essentially refers to the previous (misunderstood) prior directives. I agree that the second paragraph does make clear about the issue of a domestic address, and the third paragraph about making check-ins easier for groups with passports. And I also agree the mhlw link you provide above is a VAST improvement. I’m not sure, however, that my hotel contact received that as part of the fax campaign–as it wasn’t forwarded to me. In sum, my point is if the government is going to make it this clear about copying passports, I would like the same effort made at correcting the misunderstanding about from whom passports are required. That is not being done sufficiently, to my mind, and based upon my and others’ experiences. As my links were trying to evidence. i will continue to refuse to show my passport whenever i check into a hotel and i also refuse for the hotel front desk to make a copy of my passport. if enough people start refusing this stupid request from the hotels and if we start complaining to the general managers of the hotels, then im sure they will stop this nonsense, and for the record toyoko hotel is the worst of the worst, if there was a blacklist of hotels they should be on it..
Last week I was in Kobe, when I arrived to the hotel that I have booked on the internet, the receptionist asked for my ID. I told him, why you want it? He said because it is the low and he showed me the 2005 law in 4 languages that request all foreigners without address in Japan to get their passport copied. I told him I live in Japan and have an address that I just wrote to you in the form so I will not show you any thing. Now give me the room key. To my surprise he said O.K. O.K. here is you key! He apologized and explained that the police requested them to do so!!! I did, because I really needed to use the internet at those points in time, unfortunately. The first net cafe it happened, in Akihabara, was one where you have to become a member, they just wrote down the passport number (never had to supply any real identification in the past, my friends have given totally false information and it has been accepted with no confirmation). The second place, in Harajuku, doesn’t need registration, but they wanted to make a (colour) photocopy of the passport for first time visitors, and they’re the ones who showed me the sign in English saying police require it. I don’t speak much Japanese, they didn’t speak much English, and I didn’t have time to find a new place. I’m not sure what would happen if I went back there (they said it was only for first time visitors), since there isn’t a membership or anything. Next time I’m in Harajuku I’ll go in and try and see the sign for the exact wording. No way out of that threat as of course the police will demand to see the card if they send someone over! I chose to give it to the hostel rather than risk a more serious confrontation. I had been travelling for 12 hours and preferred sleeping in a bunk bed to answering questions in a holding cell! I have had this happen to me twice, so read the riot act both times, and will continue to do so. First time was at the Toyoko Inn in Hakata. They backed down immediately. Second time was at the Kikusui Hotel in Narita. Some family members were transitting through and had 18 hours between flights, so I went out there to stay rather than have them come all the way into Tokyo. I read them the riot act after being asked for my passport. The manager came out, went back checked the directive and then apologized, and requested they improve staff training in dealing with this. If anyone has stayed there in the last 6 months, please advise what experiences you have had. If you can’t stand your ground, don’t complain. Nothing will change. “Well, I was tired and gave up…” if you stand your ground, ask to talk to a manager, ask him/her his/her boss’s name and phone number and tell them that you will sue them, they might change their mind and let you in without a copy of your passport or gaijin card (or just show your Health Insurance card and pretend you don’t have anything else). If they call the police, then deal with it and ask them to back what they say with some OFFICIAL paper/proof (if they don’t, no reason to bother you). You might have to show your Gaijin card to the c0p, but showing it should be sufficient, they don’t necessarily have to touch it. Many comic/Internet cafes have signage or policies relating to passports as ID but I think it is really intended only as a message to temporary visitors. Whenever I have had cause to use an Internet cafe, I simply handed them my driver’s license as the ID for the card and no one ever ecen blinked or suggested that I should be giving them a passport or gaijin card. Next time you go, just use your driver’s license (if you have one) for a form of ID. My DL is the only form of ID I have had to show in years for most everything not specifically related to visa/immigration and that includes once being asked for ID by a police officer. Martin, it’s not just a matter of being tired. If you get refused, you have to find another place to stay, which isn’t always a trivially easy thing to do in peak seasons. That goes double when you’re on a budget. As undignified as it is to be treated as a potential criminal by the hotel you’re staying at, it beats sitting out on the street all night and not being able to sleep. I haven’t visited this one in a while, but when Mark in Yayoi mentioned it it sprung to mind. The hostel “New Koyo Hotel” in Tokyo asked me for my passport both times I went there back in 2004 and 2005. The interesting thing was the guy working there was foreign (American, I seem to remember). I told him that I lived in Japan and couldn’t give a passport number but he quickly replied “your passport number is on your alien registration card”. So obviously they were used to such people and knew what to say. At that time I complied but would be interested if their policy remains the same. i dont see why you feel the need to capitulate when they threaten to call the city police..
you havent done anything wrong,they are the ones that are in the wrong.city police also cant demand that you show it to someone at reception. but i dont see why this would be a serious confrontation,as the hotel has no right to ask it of you.and you are perfectly correct to refuse to show it. hotel new koyo say they dont do this:i mailed to ask them..
i think you have misunderstood our check-in procedure. we do not require passport from foreign nationals who possess valid resident registration card. we require passport from foreign nationals who do not possess an address in japan. to check-in at new koyo hotel. we require this process because the law and regulation of japanese government of ministry of health. we hope this will help you understand our situation. that they were a resident of japan. Japanese hotels are not different, but they shouldn`t be allowed to copy my IDs or Passport. I traveled to Europe last month and used 2 hotels in Belgium and Germany. Both of them gave me form to fill in, in which I had to write down my nationality, passport or EU ID number at check in, that`s it. No one even touched my documents, didn`t check and did not copied them either. My Japanese wife wasn`t reqied to show anything because booking was on my name. Easy and hassle free. Adam, I’m guessing that only your info was required because they need a person to be responsible for potential damages or unpaid charges. Over there, the police don’t use hotels as proxies to track people’s movements like Japan wants to. Just an update on the netcafe in Harajuku; I went back there again today, and they didn’t ask for any sort of ID. I didn’t recognise the staff working. I was obviously touristy (backpack and all!) so I guess the staff member didn’t care about the ‘rule’ for passports. I wrote them a nasty email and it might help if others did too.